Rosatom’s TVEL Fuel Company is set to supply the first batch of pellets to the Indian Nuclear Fuel Complex (NFC) after successfully conducting the technical acceptance procedure, Andrew Pyrinov, head of the Department of Technical Control of PJSC "Machine Engineering Plant" (part of Rosatom’s TVEL fuel company) told RIR. “PJSC ‘Machine Engineering Plant’ has successfully completed technical acceptance of the first batch of over 60 tonnes of pellets to be supplied before the end of July, 2016 to the Indian NFC”, Pyrinov said. A long-term contract for the supply of the fuel pellets for the Indian nuclear power plants was signed between TVEL and the Indian Department of Atomic Energy (DAE) in Mumbai on February 11, 2009. “The acceptance was completed without any inquiries from the foreign partners. The NFC representative noted the high quality of the PJSC fuel pellets, safety of the production processes and the improvement of the enterprise in the sphere of corporate culture,” Pyrinov said. He said the Russian company was the first to sign a long term contract to supply nuclear fuel to India after the Nuclear Suppliers Group (NSG) removed the restrictions on the supply of uranium, reactors and technology to India on September 6, 2008. The first delivery of nuclear fuel to the Nuclear Power Plant (NPP) in Hyderabad took place in spring 2009. The fuel pellets made in Elektrostal, Russia, are used in Indian nuclear reactors. As part of cooperation with DAE, TVEL also supplies nuclear fuel for the Unit 1 and 2 of the Kudankulam NPP under a life-cycle contract. TVEL has signed another contract with DAE in 2015 for supply of enriched uranium fuel pellets it produces. 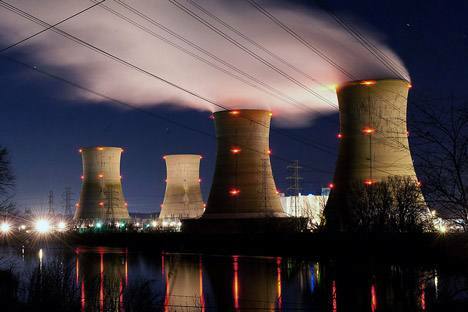 A series of shipments is planned to the Nuclear Fuel Centre in Hyderabad, a fuel assembly production site for the Tarapur NPP. N-fuel to be made in India? Oleg Grigoryev, vice-president of TVEL, Rosatom’s fuel company, recently told IANS (in an interview on the sidelines of the VIII International Forum Atomexpo 2016) that the company was looking forward to assembling fuel rods in India. Gradually, components can be produced in India for use at home, by Russia and for exports. Grigoryev said TVEL was open to the proposal for localising some production in India, but added that it would be feasible only when more nuclear reactors were commissioned. “The fuel rods can be assembled in India using the fuel pellets we supply. We have already developed and signed a roadmap with schedule and specification of what has to be done, but much depends on the number of units,” he added. TVEL has also offered India new fuel assemblies. Fuel assemblies used in Kudankulam need replacement after around eight months. The new version however will need replacement only after around 18 months. A fuel assembly is a structured group of fuel rods - long, slender, metal tubes containing pellets of fissionable material which provide fuel for nuclear reactors. "It saves 60-70 operational days in around three years, and saves $60-70 million which would have been lost had the plant not been working," Grigoryev said. The new type of fuel assembly, called the TVS-2M, consists of spacer grids welded to guide channels. It increases the number of operational days for the plant by increasing the fuel cycle, which means a greater gap before the next change. "Negotiations are on for the TVS-2M fuel assembly for Kudankulam. This is a modern design which is more efficient and contains a higher load of uranium," he said. "This means an assembly can be used for generating more power and the cost of fuel per kilowatt comes down," he said.